As Mayor for the West Midlands Andy Street has a packed diary, but that’s not going to deter him from lacing up his trainers and joining more than 10,000 runners on the start line for the Midlands most popular half marathon. He is often spotted hosting visiting dignitaries, campaigning for the betterment of the region and managing investment, but on Sunday, October 14 the Mayor will be dashing down Broad Street where this year’s Simplyhealth Great Birmingham Run will start. And he has got a tough challenge ahead to build on his impressive finish at last year’s Simplyhealth Great Birmingham Run – when his ‘Mayor’s Movers’ team of colleagues from the West Midlands Combined Authority came out winners of the Medium category in the Business Challenge. Mr Street is taking on the Run to raise funds and awareness for charity Acorns, which offers a network of care and support to life-limited and life-threatened children and their families across the Midlands. “Acorns is a charity I know very well and who do brilliant work in the West Midlands,” said Mr Street. 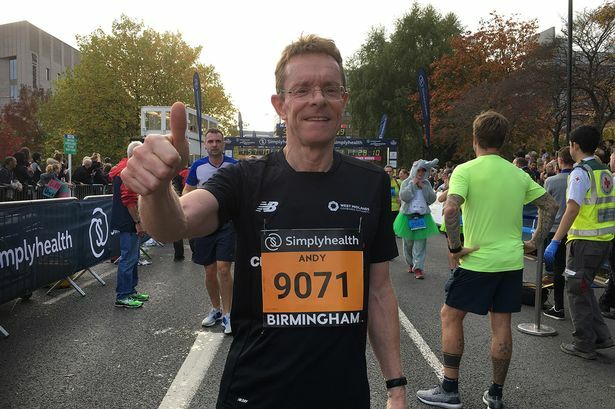 Toby Porter, Chief Executive of Acorns, said: “We are very proud that Andy Street has chosen to again run the Great Birmingham Run for Acorns. In a reverse of previous routes which finished along Broad Street, this year’s Simplyhealth Great Birmingham Run will now start on the city’s Golden Mile on Broad Street before taking runners DOWN the infamous hill of Lee Bank Middleway. The new and improved route is relatively flat and invites runners to try to for a personal best finish to the 2018 running season. Plus, anyone who entered the Simplyhealth Great Birmingham 10K will receive £10 off their entry fee for the Simplyhealth Great Birmingham Run half marathon. The half marathon Business Challenge invites firms to compete for fastest-time trophies and those all-important bragging rights in the business world.